Relevance SCF (Skp, Cullin, F-box containing complex) ubiquitin ligases regulate the degradation of many proteins involved in the control of cell division and growth. F-box proteins are the SCF components that bind to substrates, and this binding is usually signaled by substrate phosphorylation. The FBW7/Cdc4 F-box protein was first recognized by its ability to bind cyclin E, and the SCF (FBW7) is now known to target c-Myc, c-Jun and Notch for degradation in addition to its role in cyclin E proteolysis. 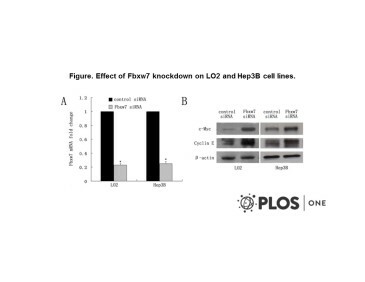 FBW7 thus negatively regulates several key oncoproteins. Accordingly, FBW7 is a tumor suppressor that is mutated in a wide spectrum of human cancers, and FBW7 functions as a haplo-insufficient tumor suppressor in mice. Tu et al. 2013. PLoS One. 8(7):e68574. PMID: 23840897. Recombinant human adenovirus-p53 injection induced apoptosis in hepatocellular carcinoma cell lines mediated by p53-Fbxw7 pathway, which controls c-Myc and cyclin E.
Nateri et al. 2004. Science. 303(5662):1374-8. PMID: 14739463. The ubiquitin ligase SCFFbw7 antagonizes apoptotic JNK signaling.